The main ingredient in Planet Waves PROTECT is premium #1 yellow Brazilian Carnauba wax, and that's what makes it such a great protectant and sealer. Planet Waves uses advanced chemistry to give your guitar finish a distinct radiance after one quick and easy application. 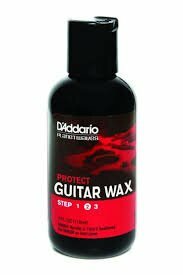 Just pour a small amount of PROTECT on a dry polishing cloth and work it thoroughly into the guitar's surface using a circular motion. After the wax dries to a haze, remove it with a clean polishing cloth. For best results, start with optional Planet Waves RESTORE Deep Cleaning Cream Polish and finish with SHINE Spray Cleaner & Maintainer.